My Mom hosted a family dinner last Sunday and I knew I wanted to test this recipe out on the Family....as most family can be, they are brutally honest. Lucky for me they are also lovers of all things sweet, with the exception of my Mom- I don't know where she came from. No sooner than we pulled the cheesecake from fridge it was gone....poor Ryan, my Sister's boyfriend didn't even get a slice that was promised to him to enjoy later since he had to work that night- I am not sure if I will ever be forgiven. 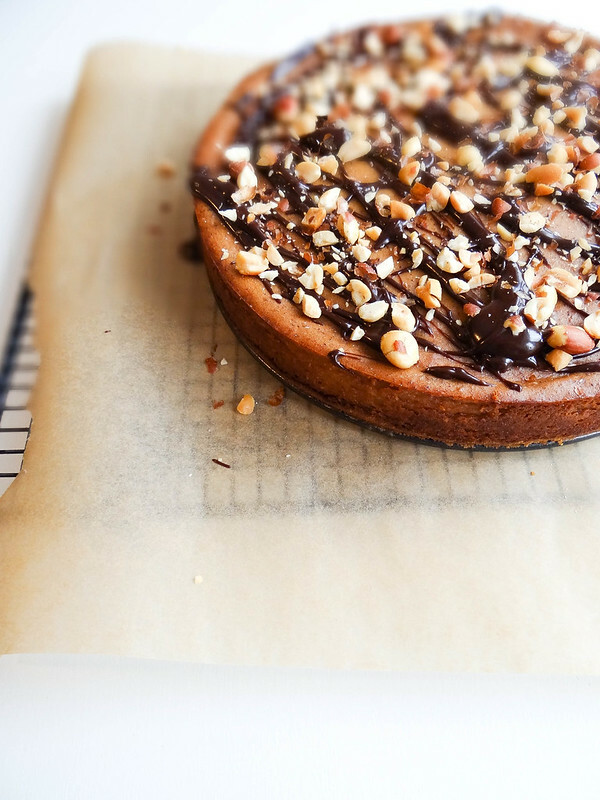 The hardest step of making this cheesecake is the waiting time - I made the cheesecake in the morning (9:00am) and it was set by 5:00pm that night. 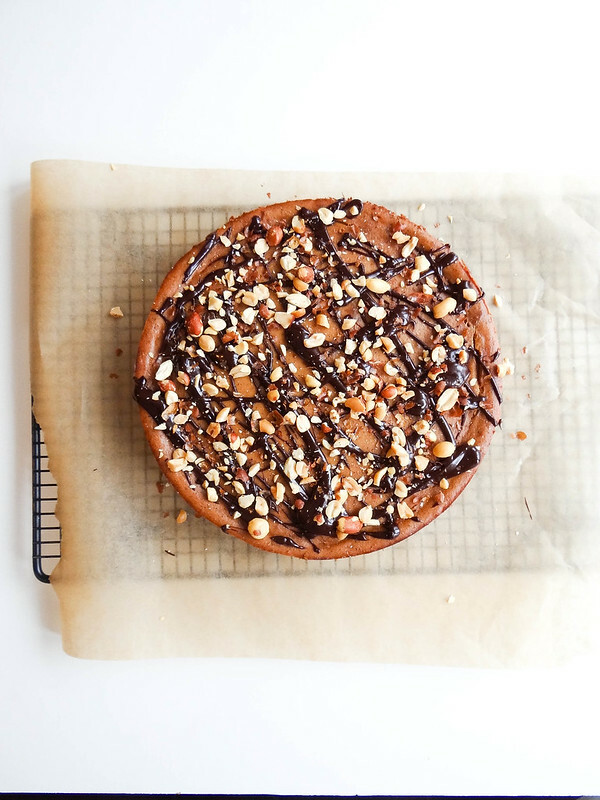 Perfect dessert to feed a crowd- non vegan or vegans alike. Make the Graham cracker crust and press into the bottom of a 9" spring form pan- set aside. In a food processor or using an immersion blender and a medium bowl, process silken tofu, cream cheese & peanut butter for about a minute or until well blended. Add Sugar & process until smooth 3-5 minutes. Bake 50 to 60 minutes, until sides are set (the very center may jiggle slightly, this is okay)- allow to cool at room temperature for 2 hours. Melt the chocolate & non dairy milk in a double boiler or in the microwave (30 second intervals) until melted and smooth. 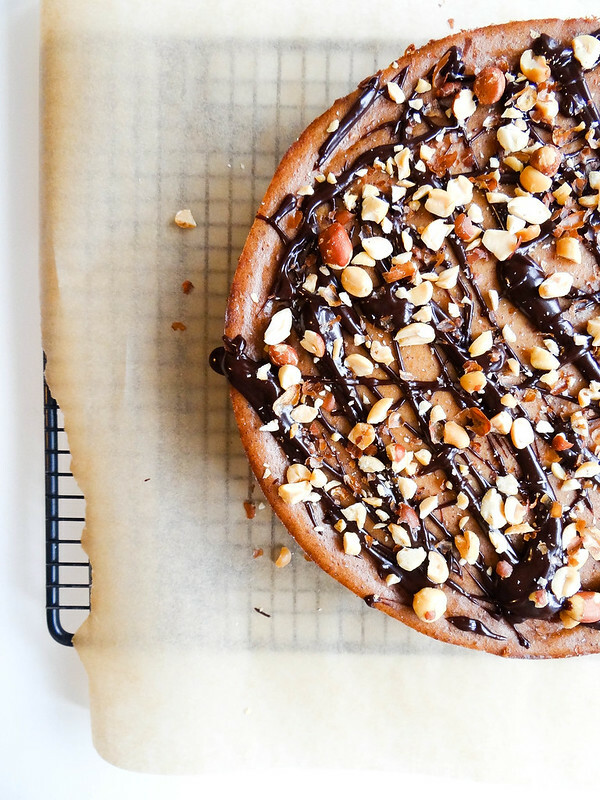 Drizzle the chocolate over the top of the cheesecake , sprinkle with chopped peanuts. Refrigerate at least 6 hours prior to serving. Keep refrigerated until ready to serve. 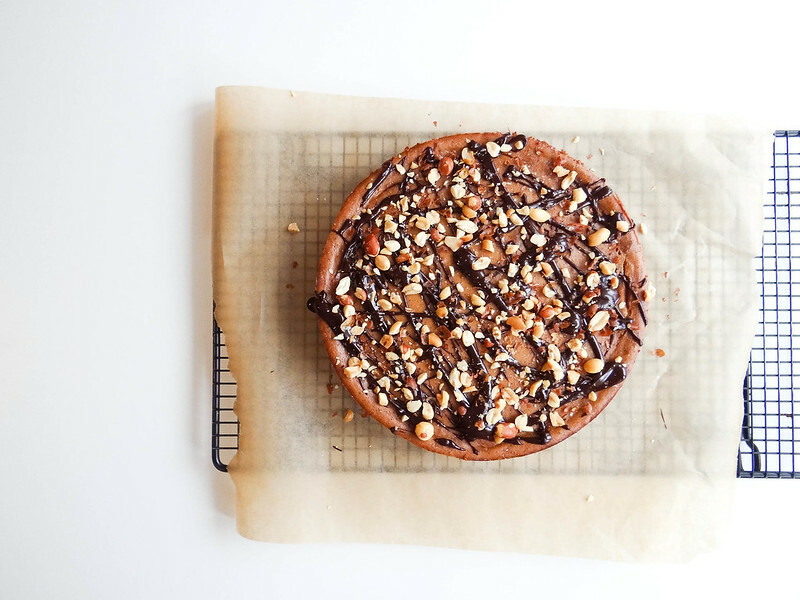 Cheesecake will keep for up to 3-4 days in the Fridge. Oh, my gosh. This looks amazing! Poor Ryan. I hope he doesn't see this blog post and realize how much he missed! girl. this is my dream come true. There is no way I'd be able to keep this around for more than a few minutes -- it looks absolutely divine! That chocolate drizzle is EVERYTHING. Thanks Kathy + thank YOU for sharing on FV!